Simply Sutter is known for fashion, beauty and interior content, but I’ve always enjoyed dabbling into other inspiring avenues, especially when they are ones that you all are requesting. 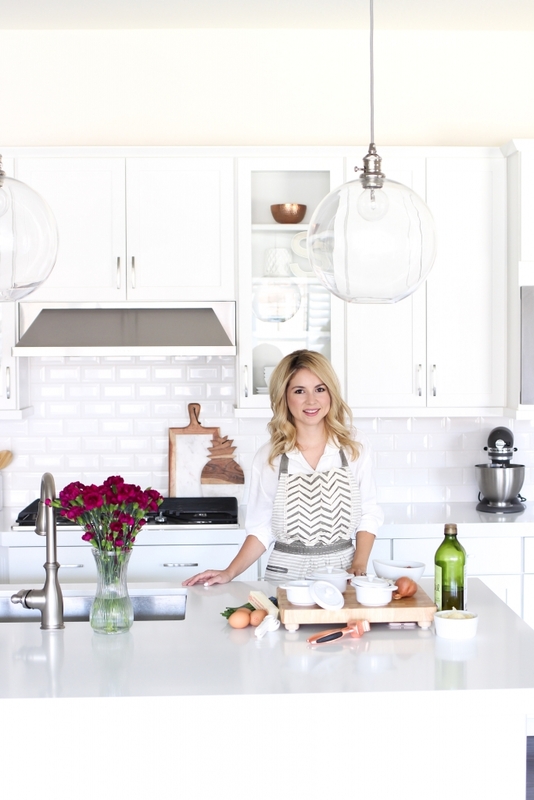 Like every category within the Simply Sutter brand I like to keep things SIMPLE yet Stylish that’s why I’m so excited to introduce to you all “In The Kitchen Series”. This Series will offer recipes that are simple to make as well as introduce you to new kitchenware brands and products. I will be sharing this new series once a month on Simply Sutter. Any and all feedback is welcome as well as any topic ideas. 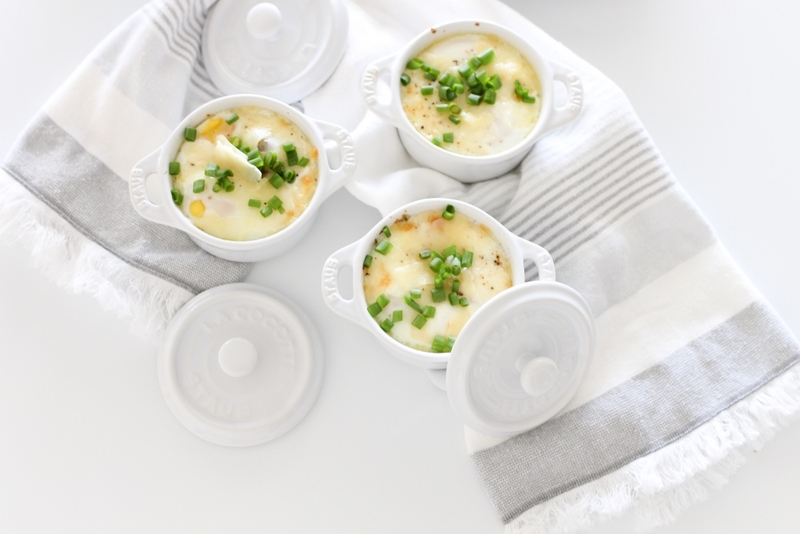 To kick off this series i’m cooking up some delicious and simple mini baked eggs using cookware from Staub. This dish is perfect for a weekend brunch. Brunch on the weekends has always been something I look forward to. Weather it is going to a sit down restaurant and having fancy crepes or a quite cafe enjoying avocado toast, brunch is a MUST. While I love going somewhere to get my brunch on! I also love making brunch at home in my pj’s. Chris and I love making dishes that incorporate eggs so when Staub sent over some of their lovely cookware I knew I had to make baked eggs and toast. If you loved my eggs in purgatory recipe you will love this one as well. Prep the fillings. In a medium pan over medium heat, add the butter and let melt. Add the shallots and sauté until soft and translucent (4min). Remove from pan and set aside. Add the pancetta and cook, stirring occasionally, until crispy, (6min). Remove from the pan and set to side. Add olive oil to the pan and allow to heat through. Add the garlic and sauté for just a second before adding the spinach. 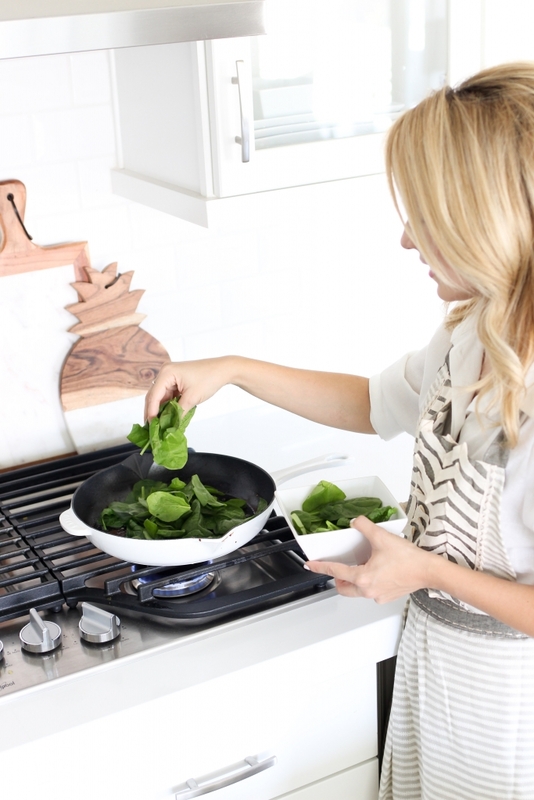 Cook the spinach until wilted (3min) Season the spinach with salt and pepper then remove from pan and set aside in a small bowl. Divi up the spinach among the dishes then shallots and the pancetta. 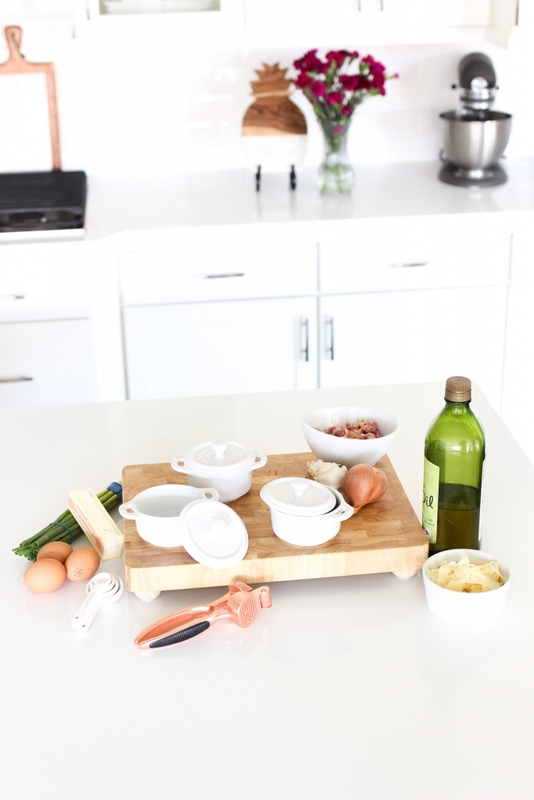 Crack two eggs into each ramekin then add a tablespoon of cream or milk to each, then add tablespoon of Parmesan. Add the ramekins to a baking pan and fill the pan with boiling water so it reaches about half way up the ramekins. DO NOT add lids. 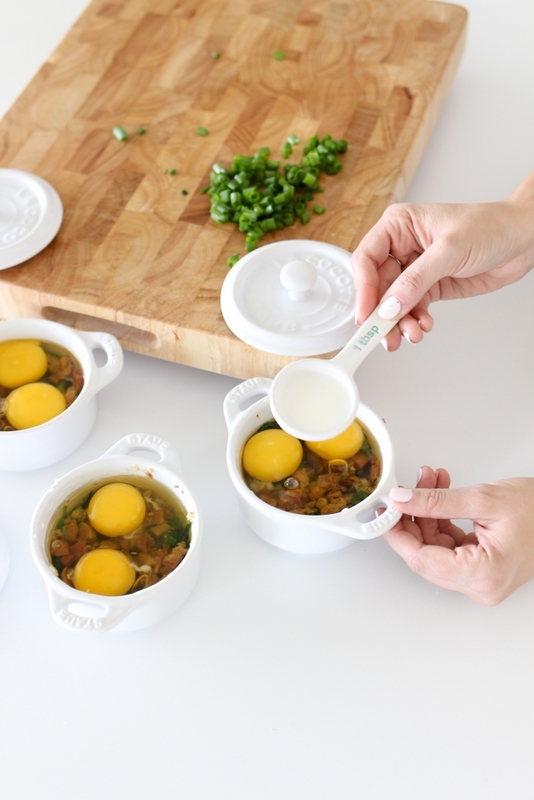 Bake the egg whites until they are set and the yolks are soft (or to liking) about 10 -15min depending on the thickness of the ramekins. Remove from oven and garnish with the rest of the Parmesan and chives. Serve with a side of toast. 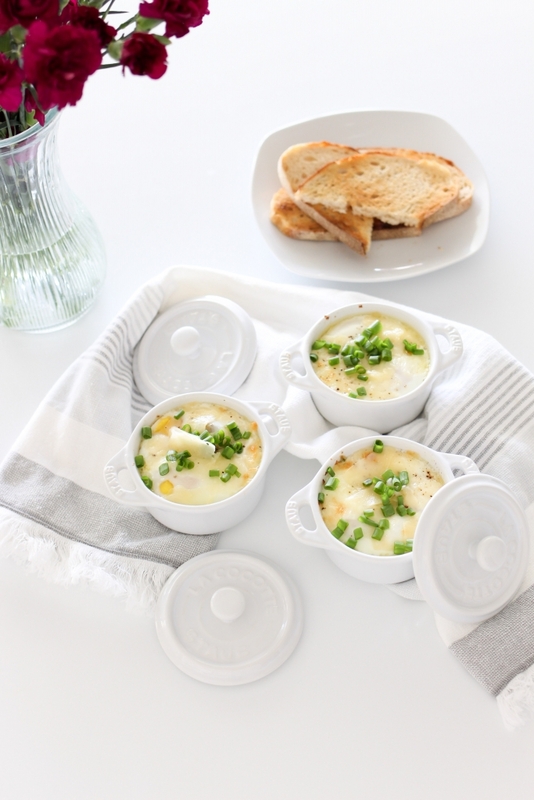 These Staub ramekins and skillet were the perfect items to create this recipe. I love the quality and how easy they were to clean. Plus anything mini is adorable! I hope you all enjoyed this first segment of In the Kitchen. If you all have any ideas of what you would like to see next time feel free to email me or comment below. Planks aren’t for Sissys ?